If you’ve ever played sports, or even if you’re just a fan, you’re probably familiar with mouthguards. 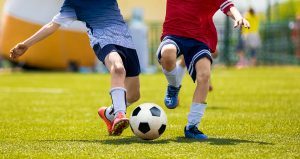 Our children’s dentist in chicago recommends that young athletes use this soft plastic or laminate device to prevent possible injuries during contact sports. The American Dental Association says that around one-third of dental injuries are sports-related and that using a mouthguard can prevent at least 200,000 of these injuries each year. Our children’s dentist in Chicago says mouthguards also protect your upper and lower jawbones from trauma and fractures. When fitted properly, a mouthguard will cushion your jaw joint, and reduce shock resulting from impact. The key to preventing these sports-related injuries is to wear a fitted mouthguard. Visit our Chicago office to achieve the highest level of protection for yourself or your child. Contact our office today by calling 773.292.1911 or clicking here for your appointment.